New York Cork Report: What Would You Like to See More of on LENNDEVOURS? This blog, like any other website, is only as good as its content. And that content, in this case the blog posts written by me and my contributors, is only as good as it is at meeting your needs and wants as our readers. So, I wanted to take this opportunity to first thank you for reading LENNDEVOURS and then ask you for your help to make LENNDEVOURS even better. Tell me, what can we do here on LENNDEVOURS that would make it a better source for information on the wines of New York State? Do you want more wine reviews? Fewer reviews? More stories and features? More event information? More about restaurants? Please leave your suggestions and/or demands in the comments. I know that there are a ton of people who read this blog, but don't comment. Just this once, at least, please do. Even if you do it anonymously. I'd love to hear what you think and what you want from LENNDEVOURS. I would love to see a section that lists BYOB places on Long Island. The BYOB scene is always subject to change ,for example a new resturant awaiting liquor license will probably be BYOB,so during that "window of opportunity" the local readers, who find these gems, could post info to your site. 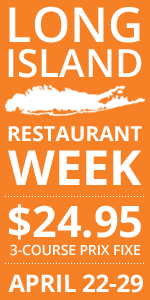 For example Love Lane Kitchen (now open for dinner)in Jamesport is BYOB for Long Island Wines. Farm Country Kitchen in Riverhead (closes at 5:00pm) & Braun's seafood in Jamesport (take-out with tables outside) allow you to bring wine. Most BYOB die-hards already know about Kitchen-A-Bistro in St. James & that many Thai establishments are BYOB. Great idea, Harold. I'm going to figure out the best way to organize and display this information on the site...and we'll make it happen. And my wife and I are going to Kitchen a Bistro tomorrow night to celebrate our anniversary...just need to decide what wines to take with us! I have been getting into wine over the last 2yrs and am officially a wine geek. I read a ton of wine blogs each week and I think you are doing a great job here. You are providing a great mix of content and I commend you on that. I agree with Harold above that a list of BYOB on LI would be great. (Love Kitchen a Bistro although the servers seem a little bothered with working at times. What would I like to see here...well I would love to have a place where we can organize tasting groups in different parts of LI. It would be great to have a online community centered here. Good luck with your new endeavors. 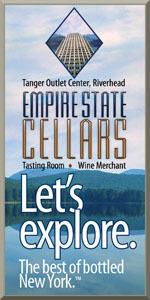 I would like to see more of your experiences going to various wineries in Long Island, the wines you are tasting there, wines in the various restaurants on the East End. It would be a bit of a leap beyond the wine focus, but I'd love to see your topical circle widen to include New York State beers. Seems like a natural, especially given your recent post on Southampton Publick House.